Every Child By Two is pleased to announce our new name…Vaccinate Your Family: The Next Generation of Every Child By Two (VYF). We invite you to visit our new Vaccinate Your Family website, which incorporates the essential information from our previous websites (www.vaccinatetyourfamily.org, www.ecbt.org & www.vaccinateyourbaby.org). We are also excited to welcome you to visit our other social media pages including @Vaxyourfam on Twitter, and Vaccinate Your Family on Facebook, Instagram, and YouTube. Each of these sites has been rebranded to reflect our organization’s new name and logo. Please help promote our new name and website, and our newly designed Shot of Prevention blog by retweeting our posts from our new Twitter handle @Vaxyourfam and sharing our Vaccinate Your Family Facebook posts throughout the next few weeks. Additionally, please “like” and share our Facebook, Instagram, and YouTube posts and videos. 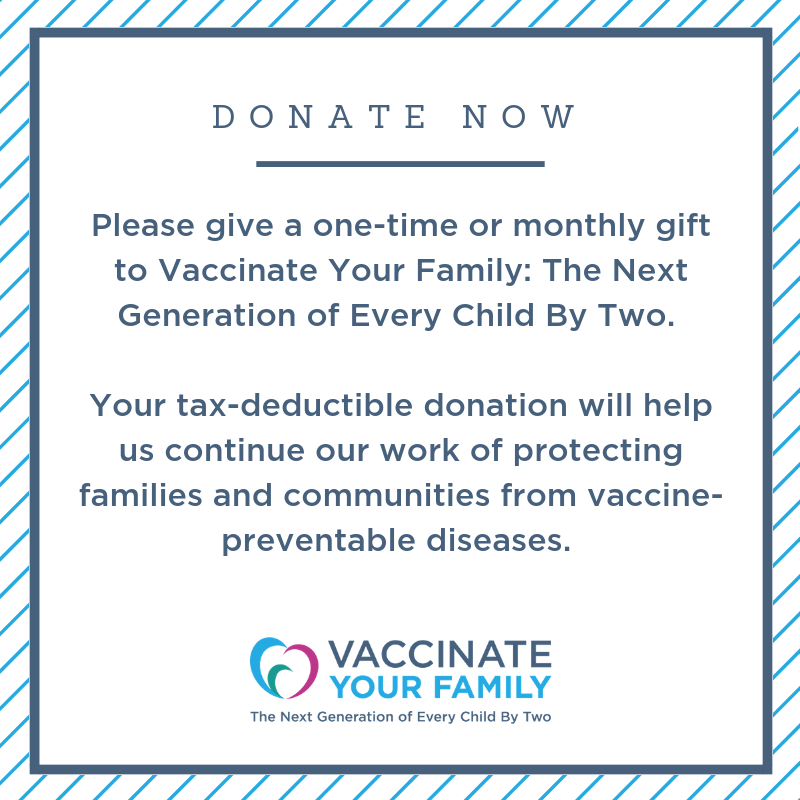 With you r generous support, Vaccinate Your Family: the Next Generation of Every Child By Two will continue our efforts to help keep families and communities healthy, knowing that as long as a single person becomes ill from a vaccine-preventable disease, our work is not complete.